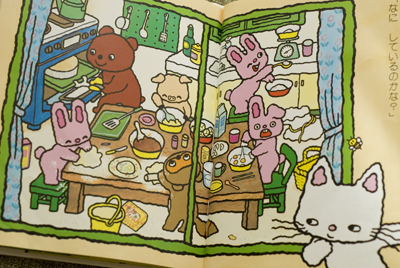 In this 1980 Japanese children’s book titled ‘Nontan’s Birthday’, a white cat called Nontan receives a surprise birthday party organized by his friends. Sensing something is up, Nontan tries to get a sneak peek at what his friends are up to but fails to see anything as they shut the curtain! 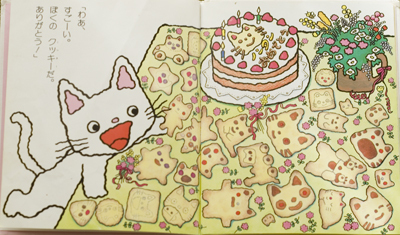 At the end, he is invited in to the house to find the table full of cookies shaped like him! The inside front & back pages has a really good cookie recipe that I want to share with you. It is ultra simple to make & its taste takes you back to sweet memory of childhood. 1. Cream the room temperature butter in the mixing bowl (cream it to the extent of it being as soft like mayonnaise). 2. Add the sugar & thoroughly mix until very airy & very creamy. 3. Mix in an egg. … Cut 5cm squares & use a toothpick to dot a face pattern on it. 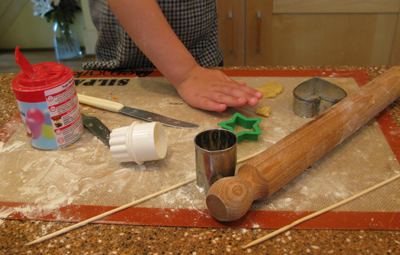 … Shape the dough like a face & use nuts/ raisins as the eyes & the mouth. … Cut a cardboard contour of the face & using a knife, cut around it on the dough. … Take some of the dough & add cocoa powder. Shape a big Nontan face & then use the cocoa dough for facial features. 9. Once baked, take the baking sheet off the tray & cool on a rack. to measure the ingredients precisely to the gram. to handle it less as possible. For example, never roll the same dough out more than twice because the extra flour from the work surface would muck up the delicate ratio of flour. it will also deteriorate the dough. to work quickly as possible, so that the butter in the dough doesn’t melt & deteriorate texture & flavour. 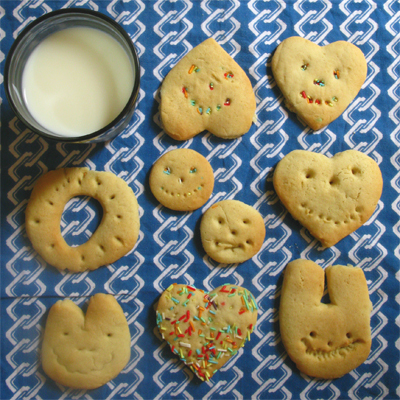 But for home-baking with my son, I’ll throw all those rules out of the window any day…! oh these cookies are the cutest. and the book, oh the book! it stole my heart. Me too Rachel! I’ve also always wondered about how foods from certain books & films taste like – for example the eat me/ drink me in Alice In Wonderland – it must’ve been pretty rad…! Hey Fanny! Isn’t it amazing that kids can come up with such cute things so naturally? I’m glad you also liked the book! Time well spent I say! Do you know the comic, Kitchen Princess? 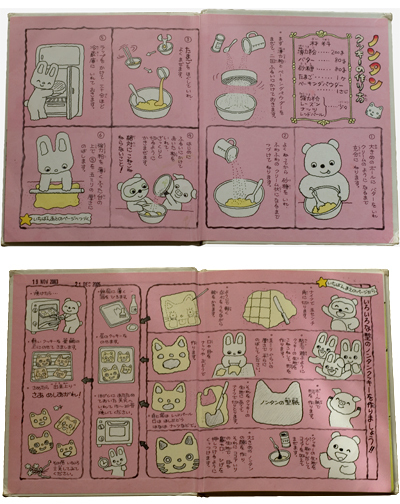 It has a recipe after each chapter, a lot of them are baking-related. 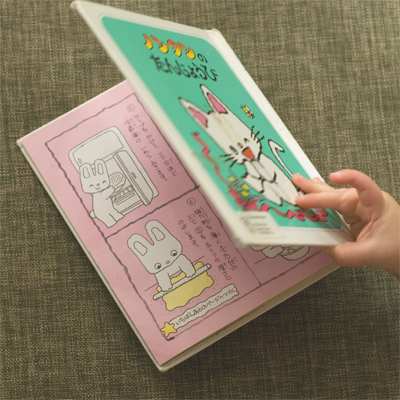 cute book! hope your little one is feeling better!!! Hi There, do you have a price list for your products, how much are the brownies please and how do I order a cake ? I’m afraid I don’t have a written price-list. The brownies for example is £2.60 for a big piece. And about placing an order, that would be wonderful! Thank you!! I hope that it is still alright! Is there a converted version of the recipe in cups , tsp, etc ? Ji, hello! Sorry for the late reply! – I’m afraid I don’t have converted version… Sorry…! !